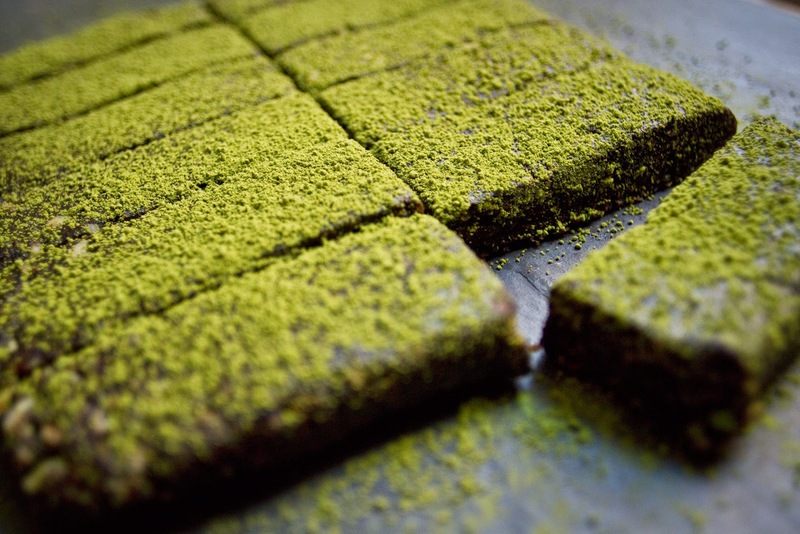 These dark chocolate matcha bars are the candy bar green tea lovers have been waiting for. They're super rich, lightly sweetened, and pack a wonderful green tea kick. 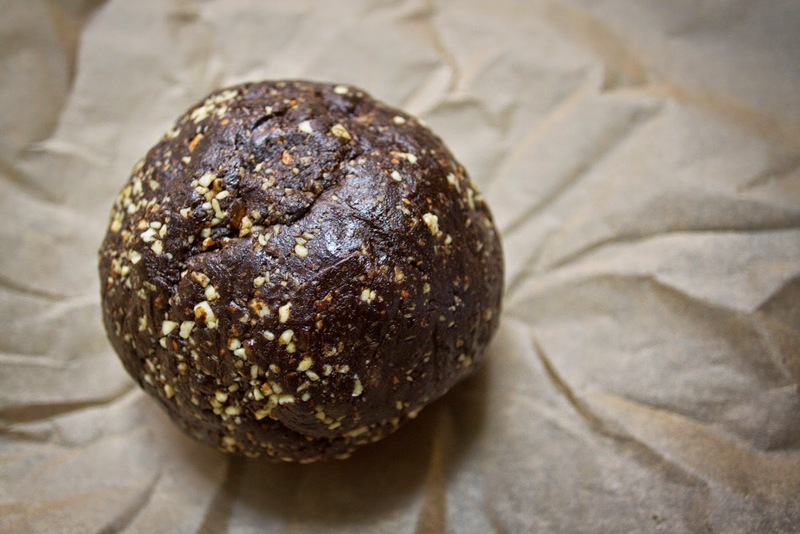 Plus, they're paleo-friendly, vegan, and gluten free, yet still crazy indulgent and delicious. S likes matcha, and after having an iced match latte at an Irish-Thai fusion spot last week (no joke, Irish and Thai in one place), he really wanted to get a bag of matcha and make his own. 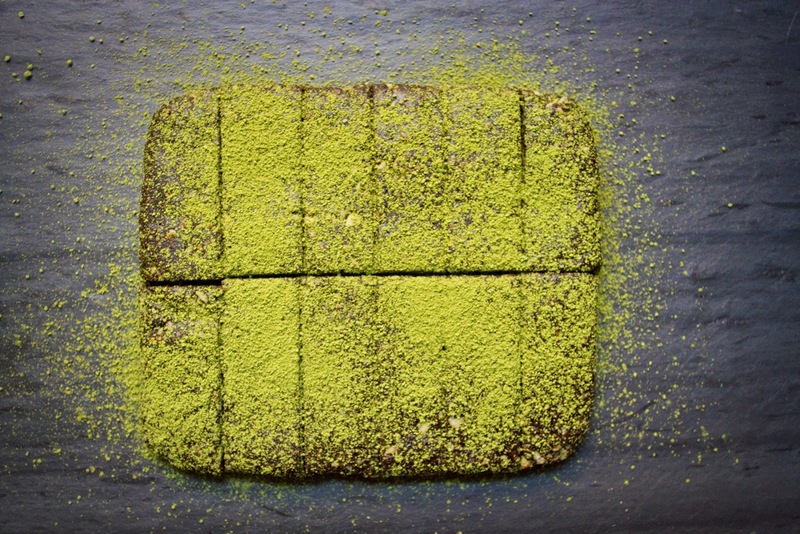 But S also loves a deal, so after pricing out little boxes containing an ounce or two of matcha, he instead bought a whole pound, because it was more economical. 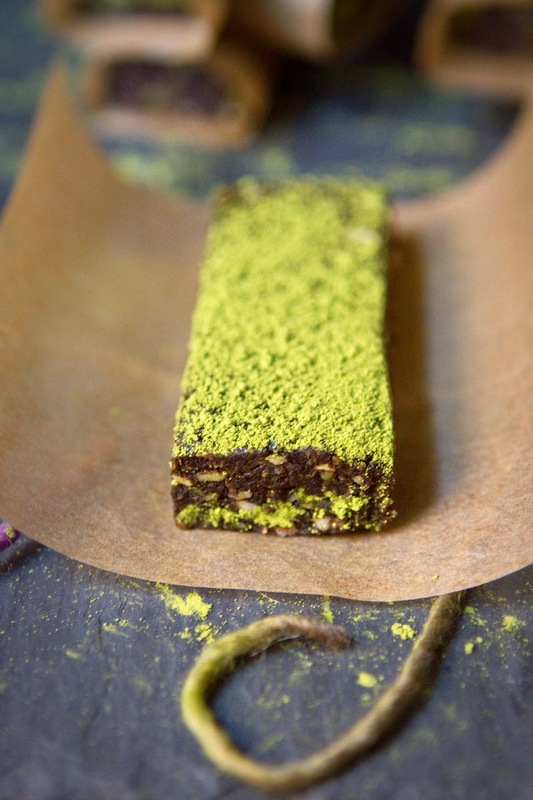 I'm not a huge fan of matcha or green tea, I actually sent S back to the deli to exchange flavors when he brought home green tea Haagen-Dazs recently, but I will admit these bars are lovely. 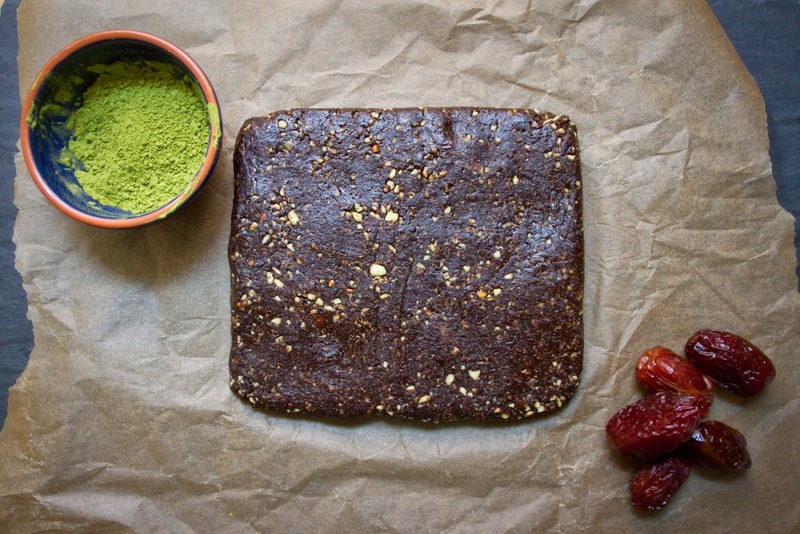 The green tea note isn't exactly subtle, but when blended with rich dark cocoa powder and dates, it's hard not to love. I could really go for one right now actually, as S and I are currently trying our very first juice cleanse. In the spirit of full disclosure, I will tell you that this is not only my first juice cleanse. This is the first time I've come even remotely close to anything resembling a diet. Or even anything resembling meal planning, or keeping track of my eating. Don't get me wrong, I try to ensure that all of our meals involve a minimum of two different colors of vegetable, and about a year ago I started trying to increase the amount of salads and reduce the amount of carbs in our overall diet, but I've never tried a diet with a name, or a cleanse, or a fast, or even calorie counting or cutting out dessert (lord help me). On Sunday I woke up wanting to try a juice cleanse. I've read about them, known several friends who tried them and spoke highly of the experience, and I drink vegetable and fruit juice on the regular, plus I have a wonderful Dash brand slow juicer, so I figured why not. I assumed S would not be interested in coming on this little juice-venture with me, but surprisingly when he woke up and I pitched the idea, he said he was in right away. I also made these bars on Sunday, but rather than feel pressured to eat them all in 36 hours before beginning the cleanse, I wrapped the remaining bars in parchment paper and popped them in the fridge, where I'm confident they'll be just fine until Friday. What a reward for making it through the cleanse they'll be! I am pretty sure you could feed these to someone who had never eaten a date bar before and they would have no idea they had fruit in them at all. 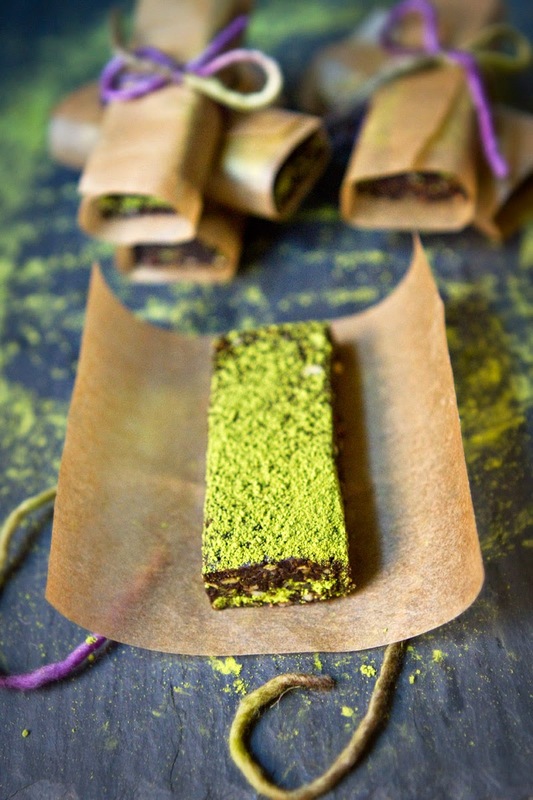 The dates just become a soft caramel-y sweetness, while the chocolate and matcha tastes take center stage. 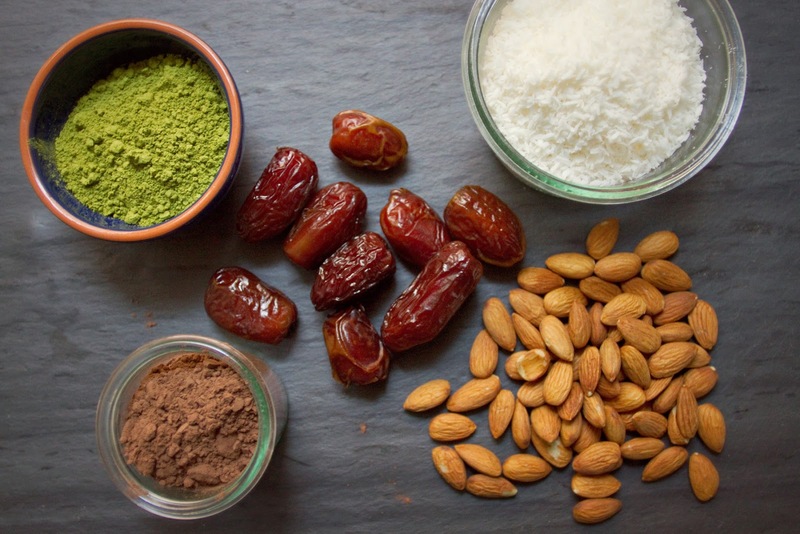 The almonds provide crunch, but not a ton of flavor, they're mainly a texture additive. 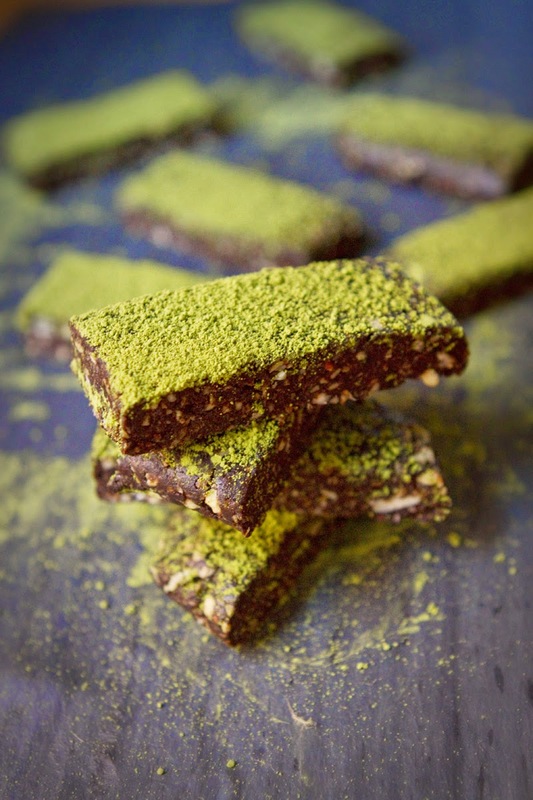 These make great candy or energy bar replacements, and are great as a dessert after dinner, or thrown in a lunchbox. While you should keep them in the fridge to keep them firm, as long as you don't leave them in a 90 degree car, they should be fine to travel with. 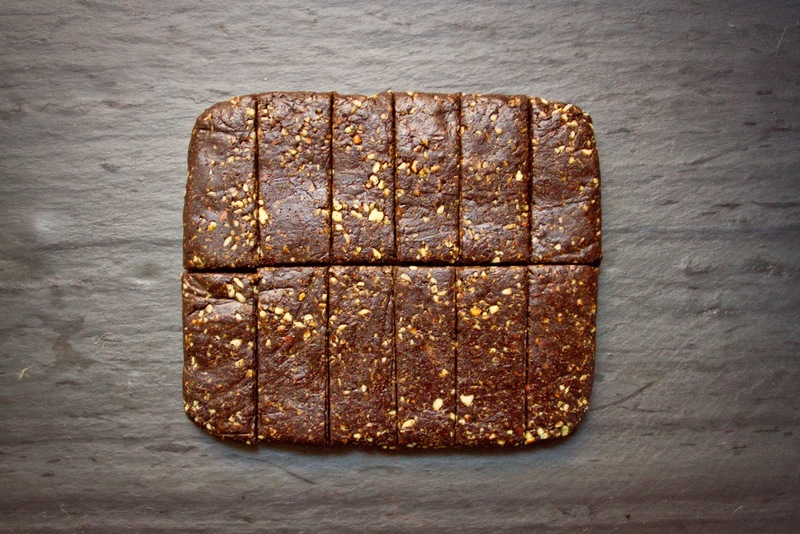 They make a great afternoon snack in the office or studio! First, if using whole almonds, chop or pulse in food processor until they're just little bits and pieces. Alternatively, use slivered almonds if you like. Are certain foods nostalgic for you? Is there a dish whose very scent can transplant you to another time and place entirely? 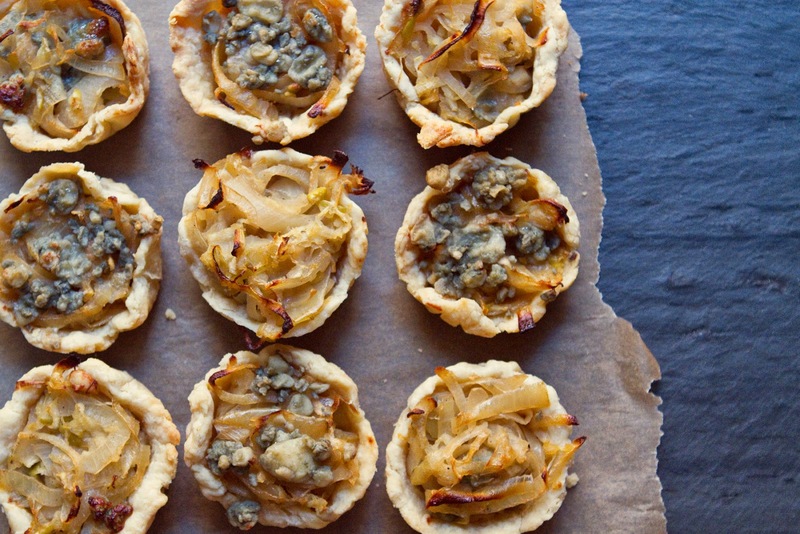 The first bite of these little onion tarts took me straight back to the quiet, lush, damp, moss-dripping, tree covered town I lived in during college. I spent two years at The Evergreen State College, where some students lived in tents in the on-campus forest, the graffiti suggested you call your mother, our mascot was a clam that looks like an unmentionable body part, potlucks were usually vegan & gluten-free, our motto was Omnia Extares (let it all hang out), and the student-run student-organized locally-sourced on campus takeout spot sold little caramelized onion tarts that I would munch on while walking through the red brick square surrounded by evergreen trees, in the misting rain, under the low grey sky on my way to class in the morning. I set out to recreate the delightful little apple cider vinegar laced, sweet onion-y hand pies that made 9am debates surrounding philosophy and the concept of the sublime so much easier to handle. When constructive conversation inevitably dissolved into semantics (When does an idea become a concept? What is a concept, anyway?) I would take a bite of my pastry, a sip of my kombucha, and be glad for the simple things. 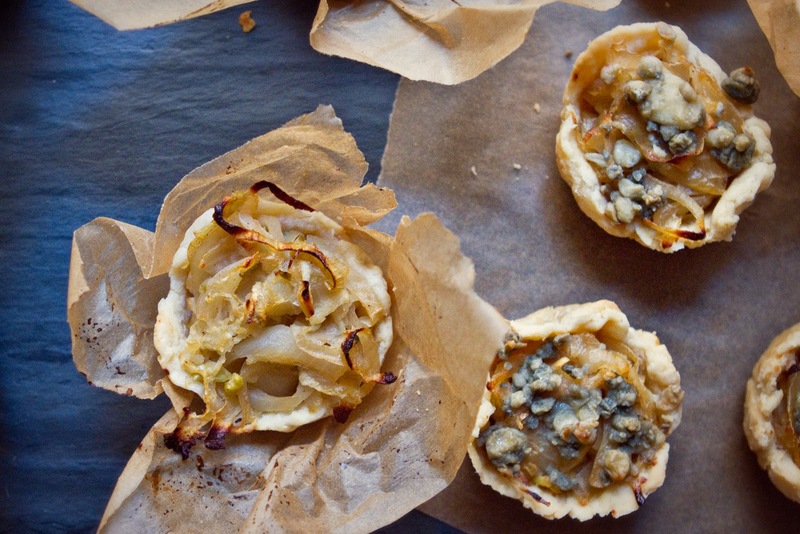 A studio in which to make art, a forest full of treehouses, a tiny pie shell full of caramelized onions. Of course, I had to add a twist to the rather basic onion filled pie of my college days. I added actual shredded apple in addition to the apple cider vinegar, and then I mixed in blue cheese crumbles, because I had some. And because I love love love blue cheese. The tart at Evergreen used a whole wheat crust, and I am sure these would be lovely with one as well, but I didn't have whole grain flour so I stuck to my usual favorite Martha Stewart recipe, which uses a food processor. I've read about why not to use a food processor for pie dough, but mine always turns out so lovely and flaky when I do. The trick, I think, is to chill the butter a lot, and only use the food processor to combine the dry ingredients and the butter, then put it all in a bowl and add the water there, then use your hands to mix. I always get flaky dough this way. I tried blind baking the crust halfway for the first batch, but found I preferred the results when I baked it all together in one go, the onions were softer and tastier from the longer cooking time, and the crust was just as nice either way. 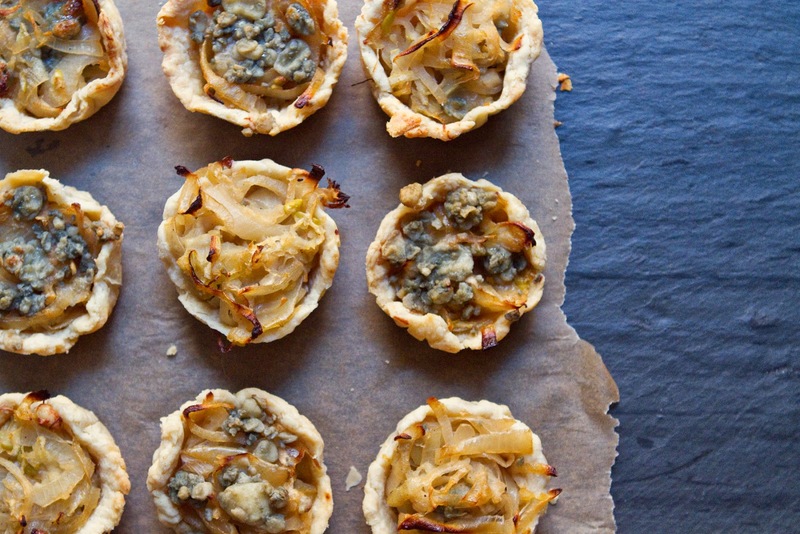 The additions of apple and blue cheese are both lovely, and add a bit of complexity. 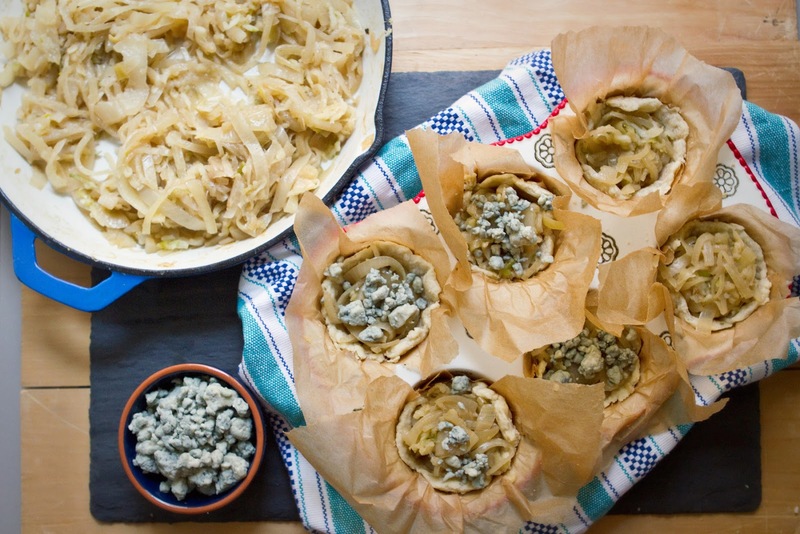 The caramelized onions are simultaneously sweet and savory, so they mix well with the sweet green apple and savory-funky blue cheese. The flavor on whole though is still heaviest on the lightly vinegary caramelized onions. Which is exactly what I was hoping for. If I close my eyes while eating one of these I can almost smell the wet earth and christmas-y pine tree scent of the air in Olympia, tinged with a streak of rainy ozone. The flaky dough and sweet onions are everything I wanted them to be, and are equally delicious warm and fresh from the oven, or room temperature a day after baking. 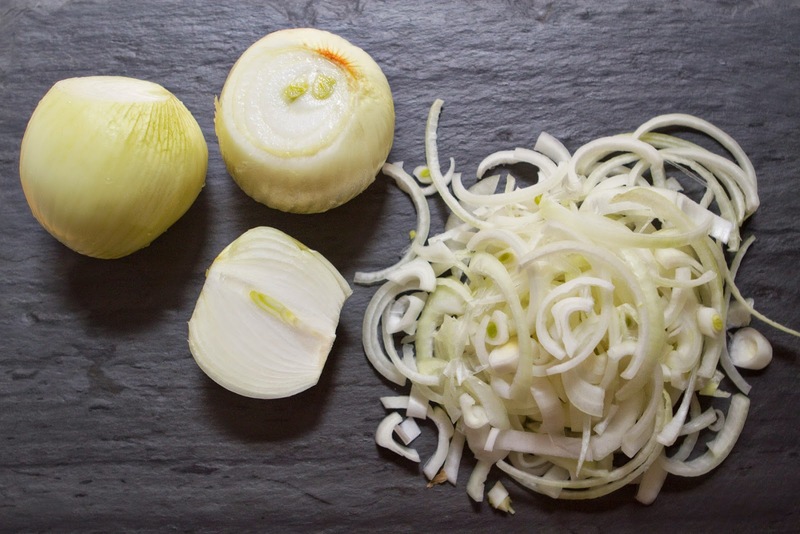 Cut each onion in half and then slice into thin half rounds, the thinner you slice the faster they will caramelize, aim for about 1/6-1/4" thickness. Pour olive oil into a skillet large enough to fit all the onions, heat over medium low heat until oil is warm, then add onions. Stir onions until coated in olive oil, once they begin to turn transparent, add 1/3 cup apple cider vinegar and the brown sugar. Stir well. 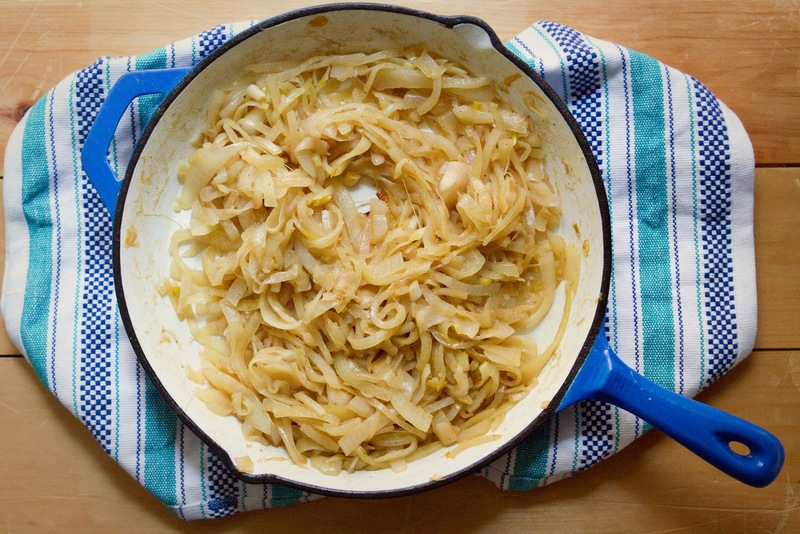 Cook over medium low heat, stirring every minute or so, until onions caramelized golden brown and thoroughly softened. This took me about 20 minutes. If it's taking too long you can turn the temperature up a bit, but if the onions begin to stick turn it back down. 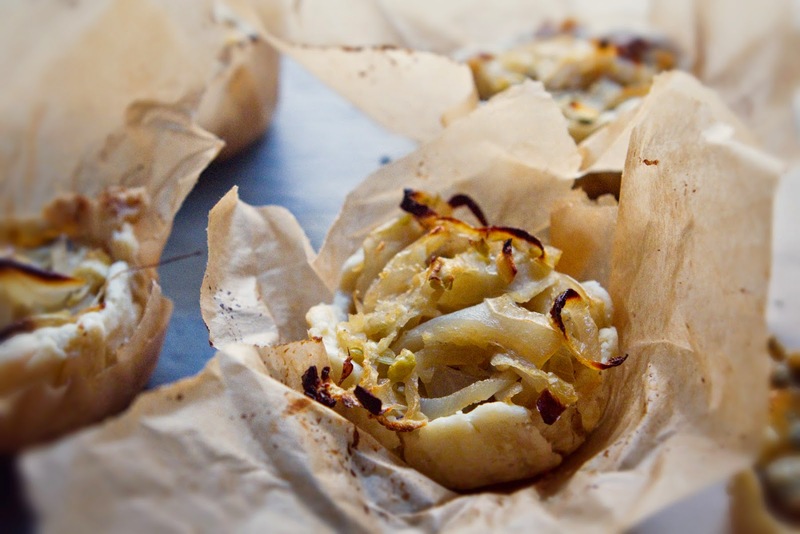 While the onions caramelize remove the pie dough from fridge, and line a muffin tin with parchment paper, or grease well with butter. Break off a small piece of pie dough and press it into the parchment paper lined muffin cup, forming the dough to the sides to make a thin crust, about 1/3" thick. Make sure to press it into the corners for optimal filling space. When onions are done, remove from heat. Preheat oven to 375 Degrees. Then, grate the green apple (peel it if you like, but I don't). I used the larger, cheddar sized holes on my cheese grater to do this. 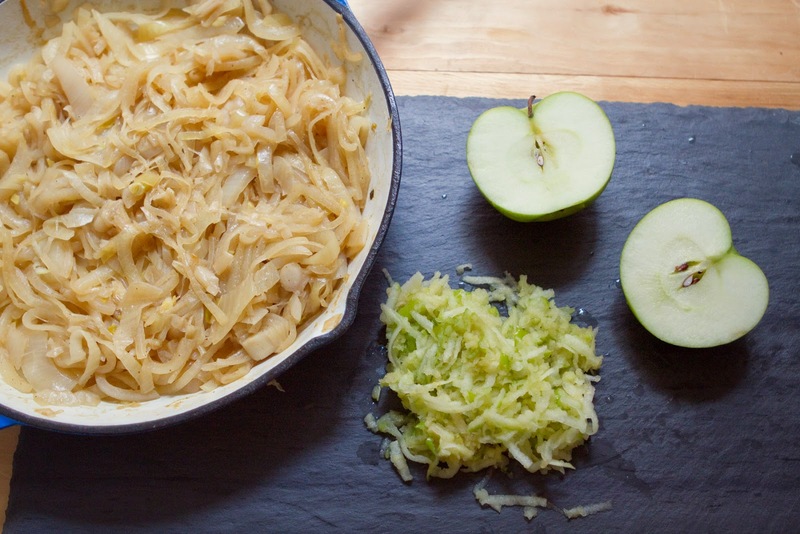 You could also use a mandoline to finely julienne the apple. Add the apple, blue cheese crumbles, and remaining 2 tbsp of apple cider vinegar to the onions and mix well. 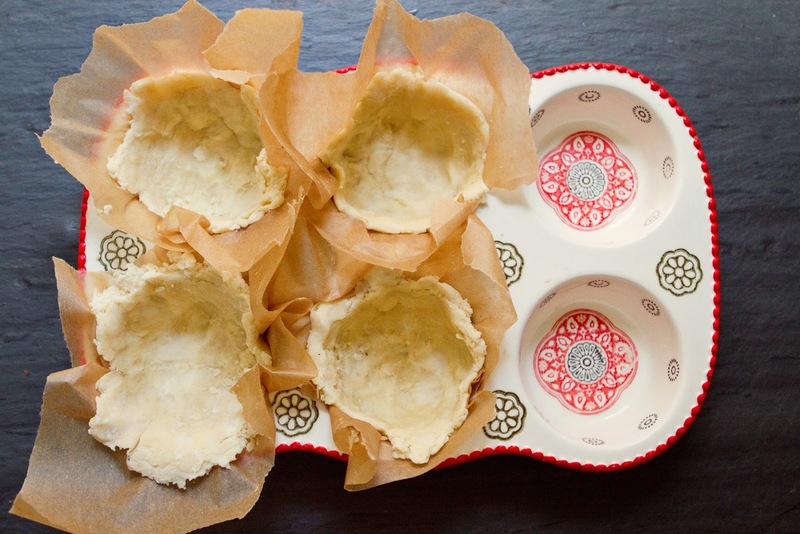 Spoon a filling into each dough lined muffin cup, filling them to the top. You can make them a bit heaping, as they'll shrink a bit while baking. Bake for 40-50 Minutes, or until edges are beginning to turn golden brown, the crust is crisp, and the onions are beginning to brown on top. Enjoy warm, or allow to cool and eat at room temperature. Mine only lasted about two days before they'd all been devoured, but they were fine unrefrigerated for that time. I love tomatoes. Growing up we had a small tomato patch in our backyard garden, full of lovely little green leafy plants growing ever more entangled with the metal cages that propped them up. I remember picking plump little red tomatoes with my father and taking them inside to cut open and eat sprinkled with a bit of salt. A fantastic afternoon treat. In college we tried to grow tomatoes in our massive, lush vegetable garden, but they were always the one plant that didn't take to the dark, moist Washington soil. Our sunflowers, lettuce greens, squashes, zucchinis, green beans, and herbs grew like wild but our tomato plants produced only meager crops by comparison. In Manhattan I've had surprisingly better luck, and my roof and fire escape garden tomatoes frequently outgrow their pots and have to be tied and tethered and propped up left and right due to their size. Keeping them thoroughly watered in the unwavering sunshine of a Manhattan July is the main difficulty, and many midsummer days S and I would alternate hauling multiple gallons of water to the roof both before and after work to keep all the plants hydrated. I typically focus my tomato growing efforts on the smaller varieties, grape, cherry, and pear We've had great luck with the yellow pear heirloom variety. I love the way little tomatoes grow in bunches and develop quickly. Plus they trick my brain into believing I'm an urban farmer. Picking one or two ripe beefsteak tomatoes takes about 5 seconds, but searching through all the bunches and branches on four or five cherry tomato plants and picking a whole pints worth of tiny tomatoes takes at least a few minutes and somehow seems to produce a greater reward. Look at all these tomatoes! I think, admiring the full bowl, we grew these on a roof in Chinatown! I would call tomatoes my favorite vegetable but S always reminds me they're a fruit. I like them prepared pretty much every way but ketchup (you won't be finding many recipes calling for ketchup around here). Marinara, tomato salad, bloody marys, ragu, salsa, sun dried, eaten plain, roasted- I like all forms of tomato. S, however, does not like hot tomatoes. He'll eat a tomato sauce or ragu, of course, being Italian, but he doesn't like roasted tomatoes. Which is a shame, as they're awesome. So this weekend when I found myself with a day on my own I decided I would make something with roasted tomatoes. The only problem is that I regularly have great recipe ideas that involve roasted tomatoes which I resist making since S doesn't like them, and I just didn't know where to start. Roasted tomato pasta salad? Roasted tomato tart? 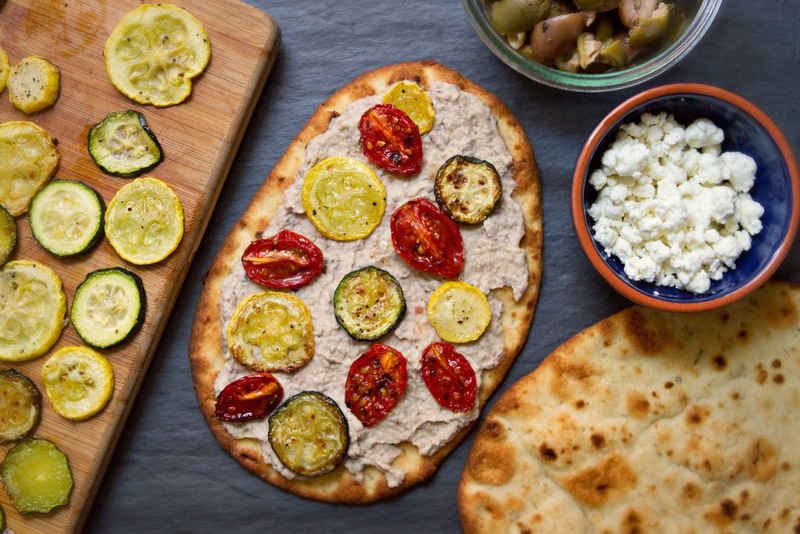 I decided to go with this flatbread because I recently made this white bean-olive hummus for a different flatbread and it was so good I had to share it. 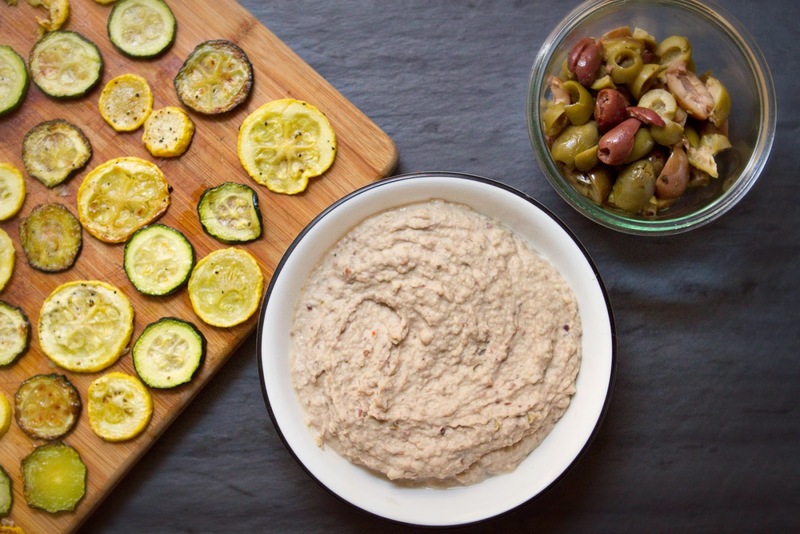 I love white bean hummus as an alternative to chickpeas. 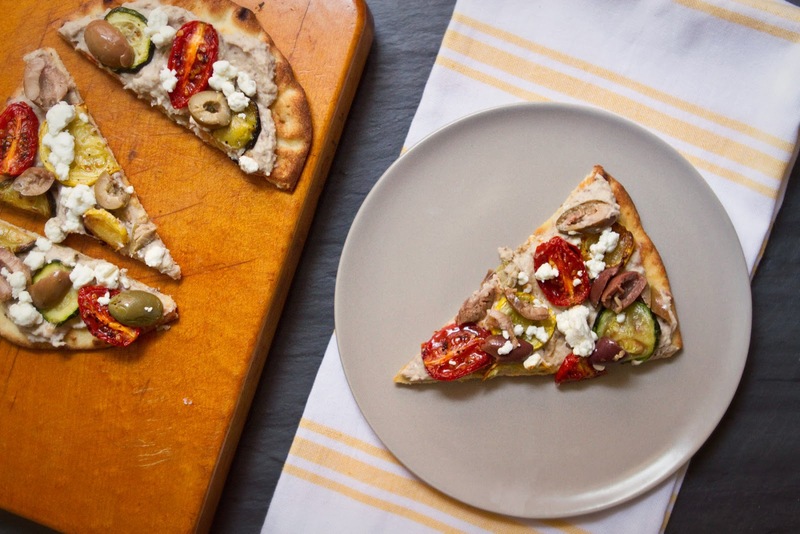 You can use all white bean or go 50/50 with chickpeas if you prefer. The flavor is similar, but the white beans make a nice change from the usual chick peas. They're also fat free, though of course the tahini and olive oil are not. 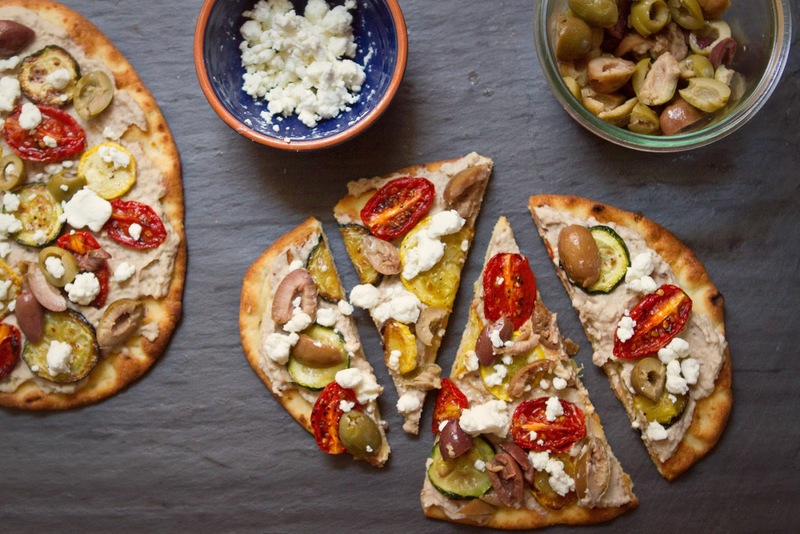 These flatbreads make a lovely lunch or dinner. Or serve pre-sliced as party finger food! Makes 3 personal size flatbreads with some leftover hummus. Preheat oven to 400 degrees fahrenheit. Slice zucchini and summer squash into rounds about 1/6" thick. 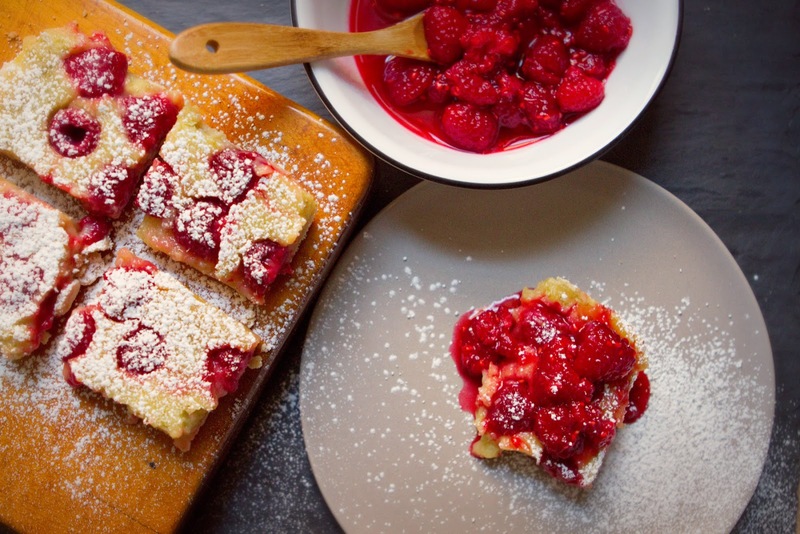 Toss with 1 tbsp olive oil and arrange on a greased jelly roll pan in a single layer. Similarly, cut tomatoes in half, toss with 1 tbsp olive oil, and arrange, cut side up, in a single layer on separate jelly roll pan. Sprinkle both the squashes and the tomato with salt and pepper, and place in oven next to each other (if one pan needs to go in the back, make it the tomatoes, they cook longer). Roast for 8 minutes, then flip all the squash slices. Roast another 8-10 minutes, until the undersides of the squash slices are beginning to brown. Remove squash pan and set aside. Check the tomatoes, if they're not browning on top, turn the oven up to broil and position the pan under the broiler. 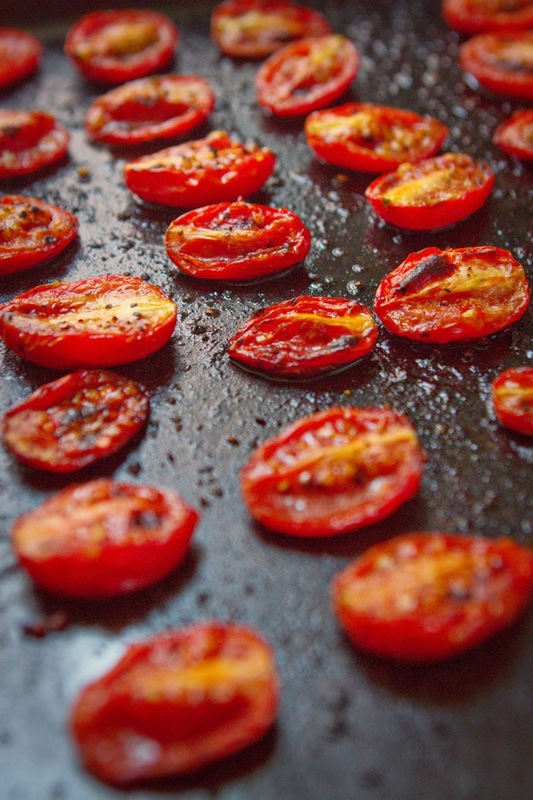 Let tomatoes broil about 3-4 minutes, or until beginning to blacken on top. Remove from heat and set aside. While vegetables roast, place all the hummus ingredients in the bowl of a food processor and blitz for 2-4 minutes, until hummus is pretty smooth. Set aside. 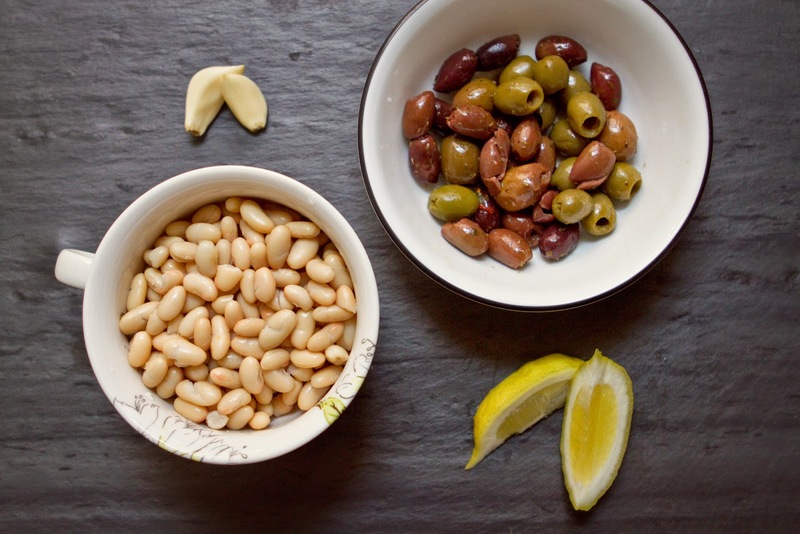 Chop the remaining 4 oz pitted greek olives.m Set aside. 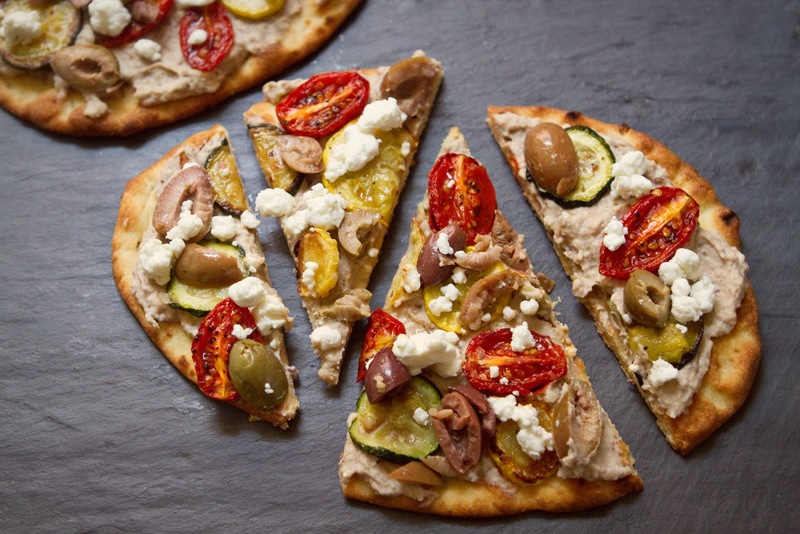 After the vegetables are out of the oven, adjust temperature to 450 and place the flat breads directly on oven rack. Toast for 2-3 minutes, until the bottoms begin to crisp up. Remove from oven. 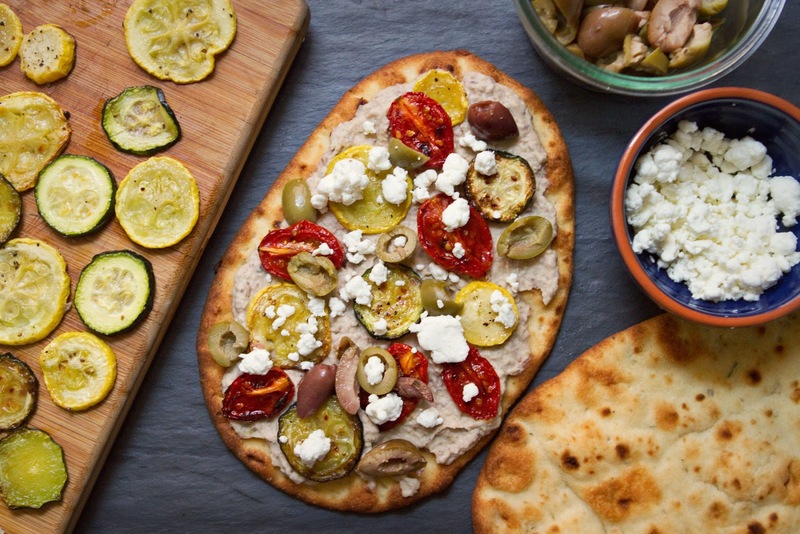 Dollop hummus onto each flatbread and spread out with a spoon, top with zucchini, squash, and roasted tomatoes, sprinkle with chopped olives and crumbled goat cheese. 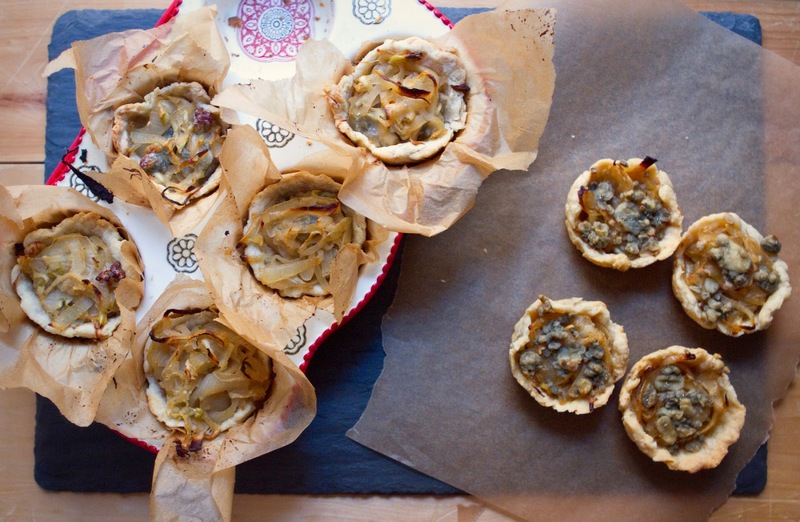 Cut into wedges with a pizza cutter and enjoy! On the dead end street where I grew up, summertime meant block parties, barbecues, clam bakes, 4th of July get togethers, and general merry making, which in turn means outdoor feasting. I supped on ambrosia salad and 7 layer dip from many a delightfully midwestern buffet spread off a card table beside a garage in my childhood, and let me tell you, it was glorious. Pigs in a blanket, hash brown casserole, strawberry jello salad, "asian" coleslaw which consists of carrots, uncooked ramen noodles, almonds, and confusingly (and deliciously) raisins tossed with a rather sweet dressing. These are some of my favorite staples of summertime potlucks in Northeast Ohio. And of course roast corn. Ohio has the best, sweetest corn in the world. And then there was the dessert table. A veritable heaven of gooey chocolate brownies, jam thumbprint cookies, mini cherry cheesecakes involving a jello layer, and my mother's lemon bars. Lemon bars were a go-to pot luck dish in our house, in fact I mainly remember my mother making them for parties, not for home consumption. 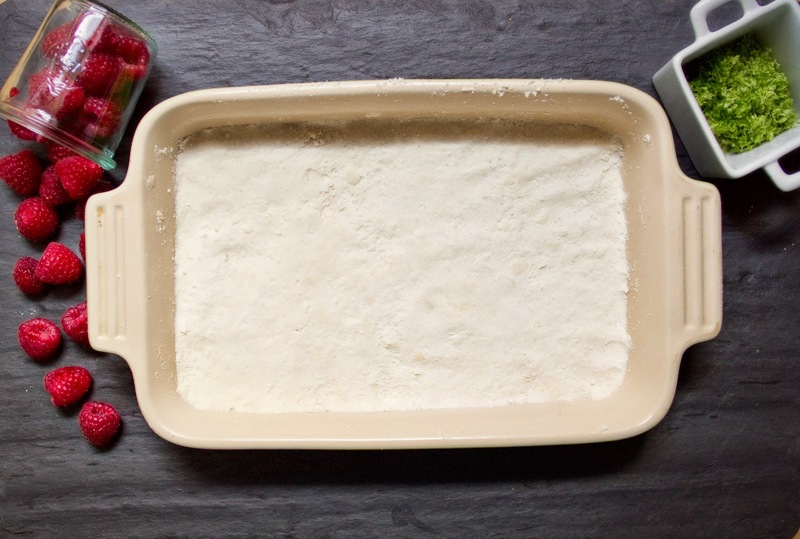 To be honest, I think we usually used a particularly tasty boxed lemon square mix. I definitely remember a boxed mix being involved at least sometimes, but I also remember the bars being ridiculously delicious, sticky and sweet and tart and citrusy and delightful. I like starting from scratch so when I got a craving for a custard-y lemon bar the other day, I set off to make them for myself. 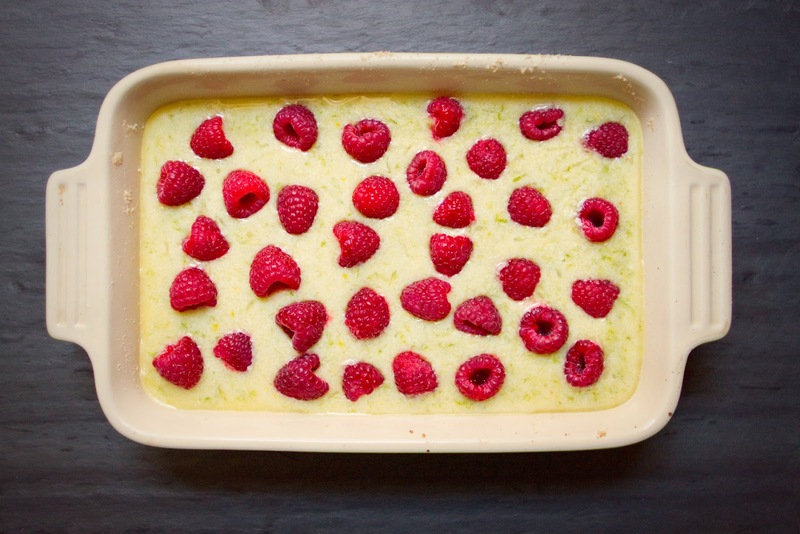 And then I decided to complicate things by making them lime bars because I prefer lime to lemon, and then to add raspberries because they were on sale, and then to use coconut because I love coconut, and because I have a big jar of coconut butter but no regular butter at the moment. In the end, after I finished changing around ingredients and amounts ten times this turned out to be a simple recipe, very easily executed and incredibly tasty. I love a good egg custard, and the toasty coconut crust reminds me of the addictive coconut buns I used to buy from the Caribbean bakery by my old apartment in Crown Heights. 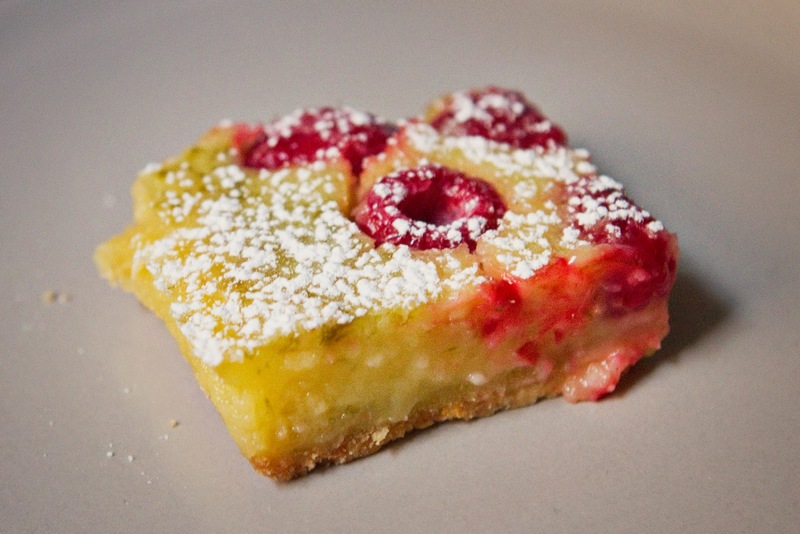 I set off trying the recreate the lemon bars of my childhood, but with all my lime-raspberry-coconut additions the pastry I ended up with has the same crispy crust, and the same rich, luscious custard, but the flavor is totally different. The coconut somehow changes everything. It's definitely still a summertime treat, but the flavors make me think more of a humid, tropical place like the Florida Keys than they do of a midwestern summer barbecue. This lime bar is like a miniature vacation to a beach, like a sip of tart raspberry limeaid from a boardwalk concession snack. The coconut adds a creamy, rich note, like having Pina Colada's while watching the sunset. Obviously I am ready for summer. These would be lovely with key limes, which is how I wanted to make them originally, until there were no key limes to be found at the store. 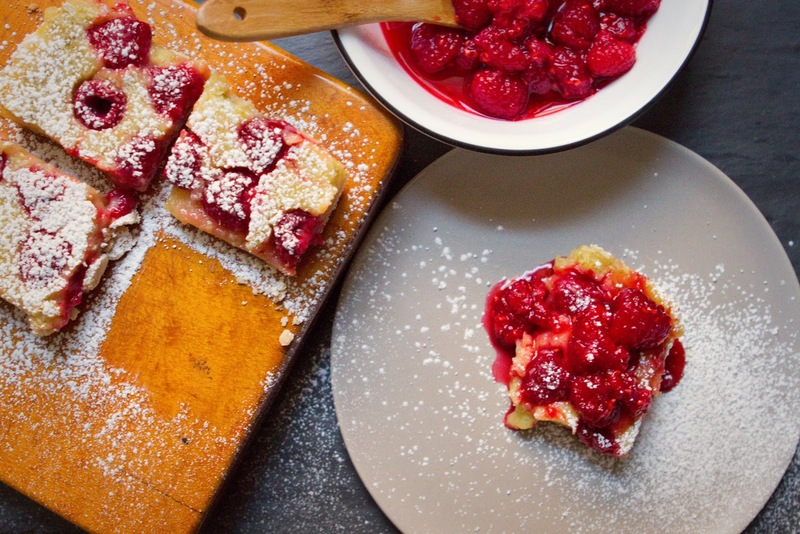 The recipe includes a bit for a raspberry topping which is super tasty and great if you're planning to eat these with a spoon out of a bowl, but if you're taking them to a party to be finger food, I recommend skipping the topping and simply dusting them with some powdered sugar. These didn't last long in our house, they were just too delicious to resist. They're definitely tart, but not overwhelmingly so, but if you're a fan of a sweeter citrus treat, you could add 2-3 extra tablespoons of sugar to the custard filling. 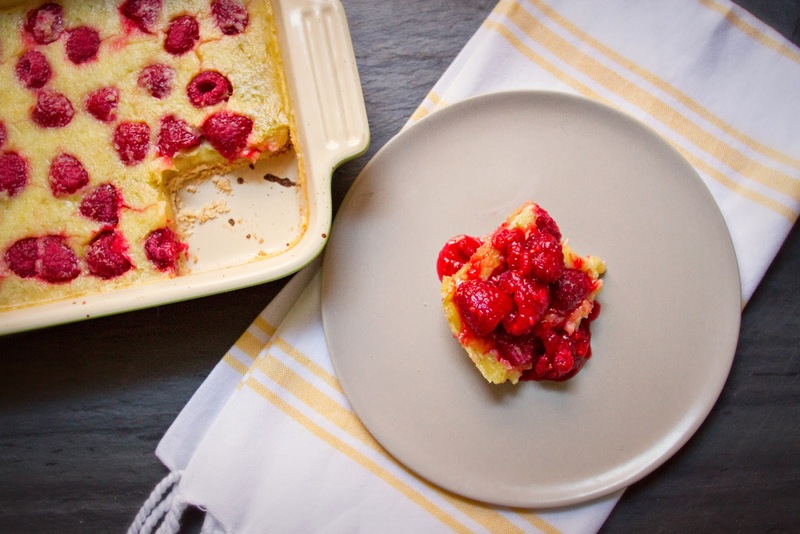 However, I think they're perfect as-is, the raspberry and coconut crust adds sweetness to the lightly tart, refreshing custard. 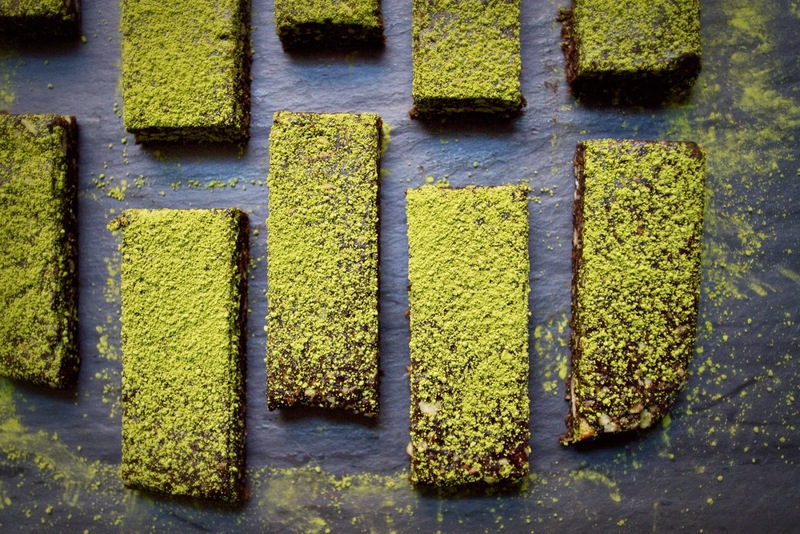 These lime bars are like a little bite of summertime. 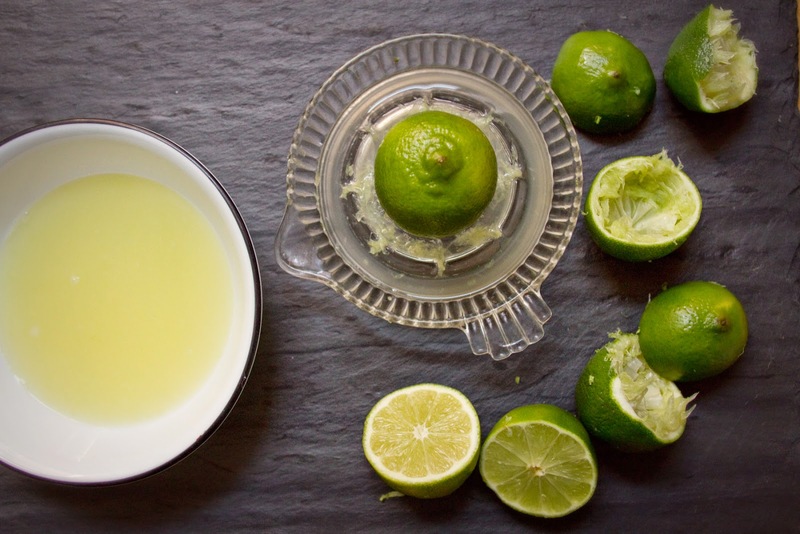 First, I like to prep my lime juice and zest. 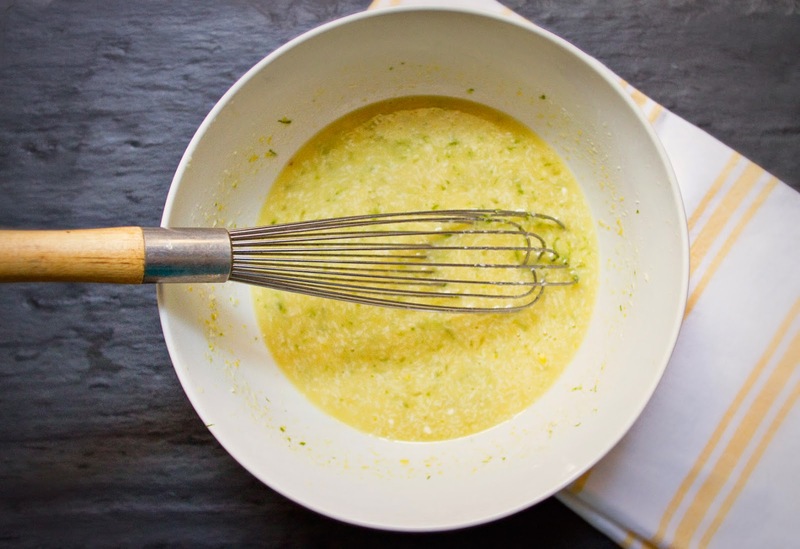 I use a microplane to zest my citrus, but a fancy citrus zester will work, too. Zest limes then juice them so you can juice the limes you zested first. Set aside zest and juice. 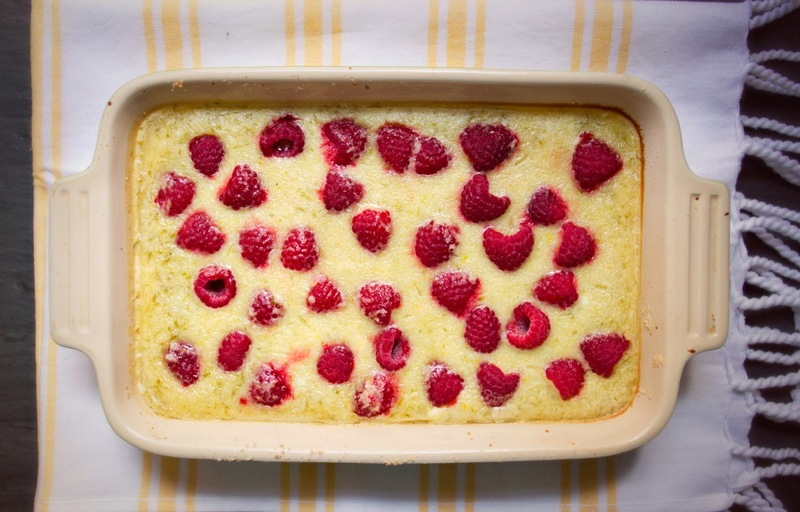 Wash the raspberries and set aside. For the crust, in the bowl of a food processor, combine 1 C flour with the powdered sugar, 4 tbsp shredded coconut, coconut butter, coconut oil, and salt. Pulse until mixture reaches the consistency of bread crumbs. If you squeeze a handful it should stay together well. 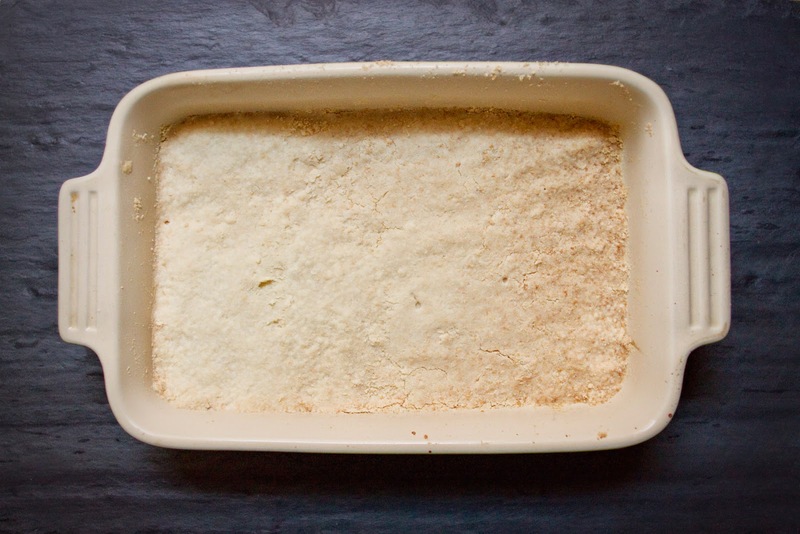 Oil a 9x9 baking pan, and press the crust mixture evenly across the bottom. Press down on the crust so the mixture is packed down, not loose. Bake for 18-22 minutes, until very lightly golden brown. 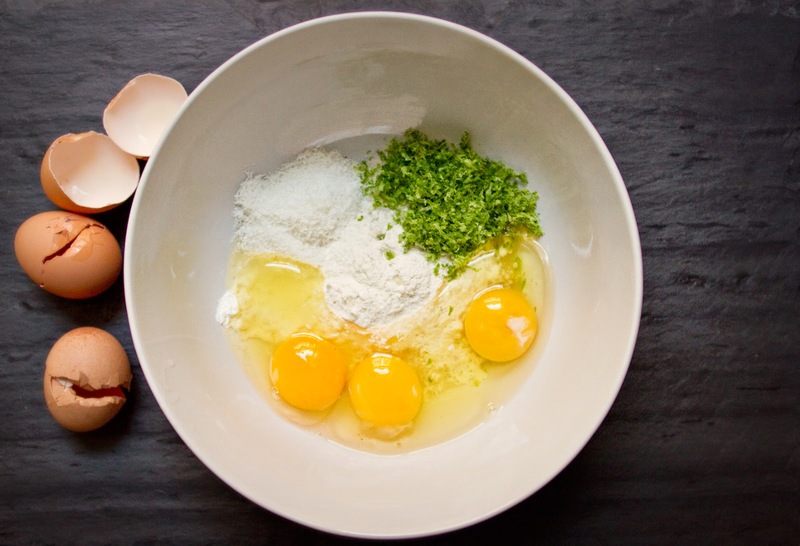 While the crust bakes, in a medium mixing bowl combine the sugar, lime juice and zest, 2 tbsp shredded coconut, and eggs. Mix well. Continue stirring while sifting in 2 heaping tbsp flour, to prevent flour clumps. Whisk until smooth. Remove crust from oven when ready, reduce oven temperature to 325 degrees fahrenheit. Pour the filling over the hot crust, and add 6 oz of raspberries after the filling. You can line them up attractively, or just plop them into the filling willy-nilly, as I did. Bake the bars for about 20 minutes, until the filling as firmed up. Remove from oven, let cool to room temperature, then chill 1-2 hours to desired coolness. 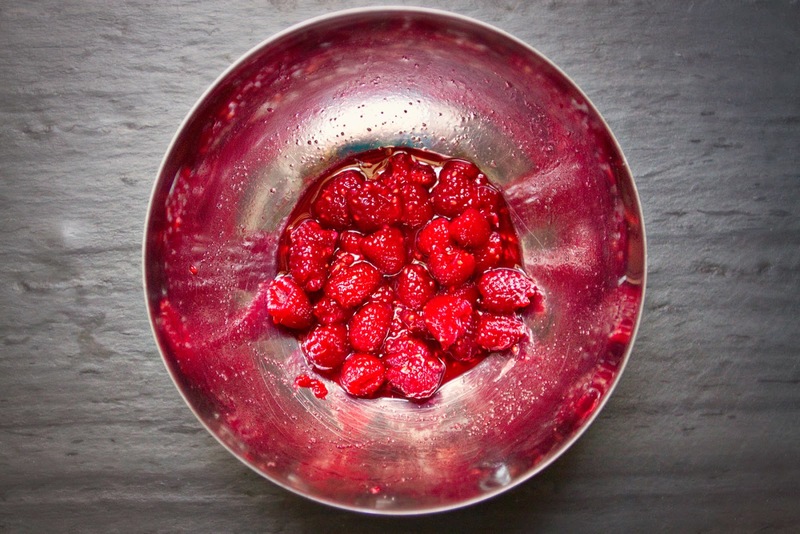 While the bars cool, in a small mixing bowl, combine 6oz raspberries, 1 tbsp lime juice, and 1 tbsp of either sugar or honey, and mix. Mash a few of the berries up roughly with a spoon, and then allow to sit so the sweetener and lime can soak into the berries. 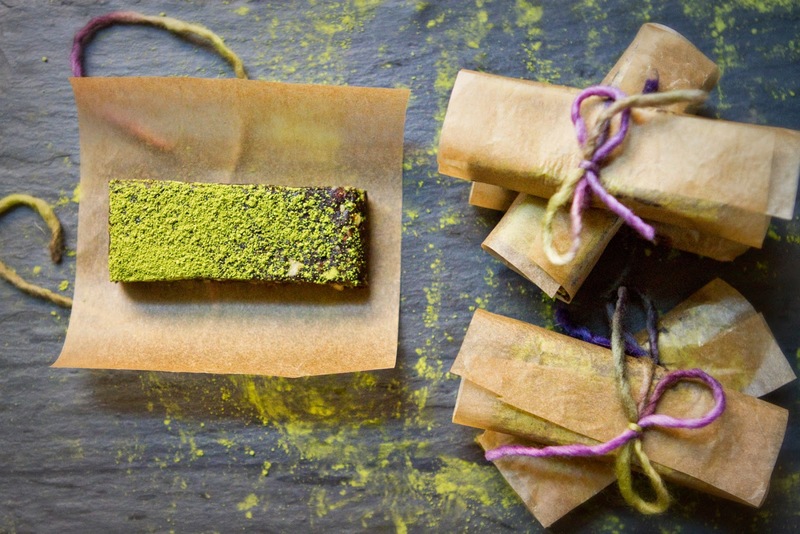 Spoon this over top of each bar for an extra decadent treat. Sprinkle with a bit of powdered sugar to top it all off, if you'd like.